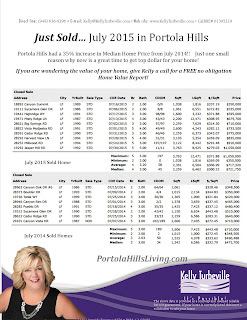 PORTOLA HILLS LIVING by Kelly Turbeville: July 2015 Portola Hills saw 35% increase in pricing!! 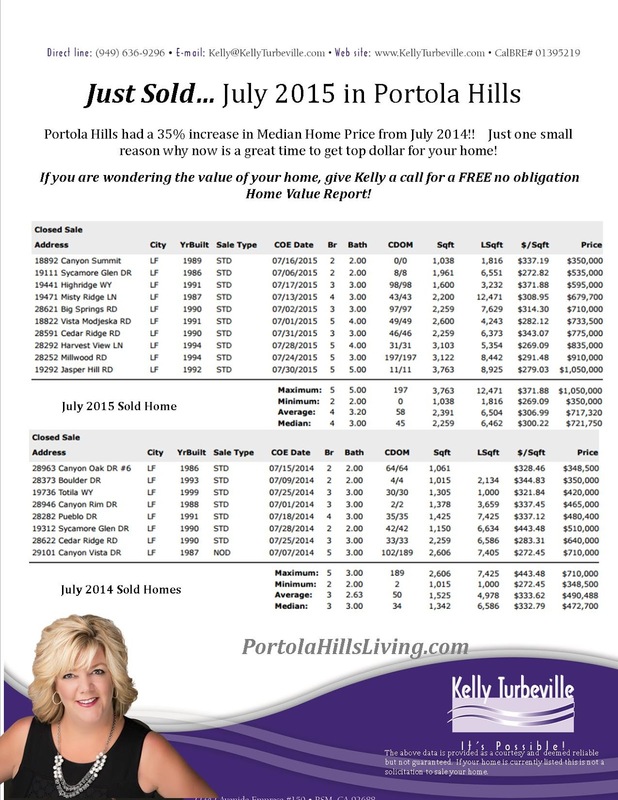 July 2015 Portola Hills saw 35% increase in pricing!! This past July was a busy one for the Portola Hills real estate market. Home sales were up 20% and hold on tight the median price for homes sold was up 35%.. Plus in the last week of July, 6 homes opened escrow!! So why the craziness, you might Ask! A couple of things!! Inventory is very low with all of Orange County only at 1.5 months! Buyer demand is extremely high and buyers want in before projected interest rates increase later this year! It's Portola Hills.. The community is sought after for not only its location, the schools are good, views are spectacular, etc. However, the big difference here is the mix of homes that sold! This year more higher-end larger homes took advantage of their equity position and decided to sale!! Take a look at the mix of homes that closed escrow this year vs. last. It will be interesting to see if this trend continues!! My crystal ball might be fuzzy.. But I would project with the new development The Oaks coming along in early 2016, inventory in the area will increase.. The Oaks is the new community developed by Badwin and Sons will include 309 Luxury Estate homes! Ranging in size from 2692 to 5200 square feet!! Sales prices have not been released yet but are estimated to start in the $1 million range or at fair market value. If you are looking to move into one of the new homes, make sure to give Kelly a call! We have developed a special program for Portola Hill Residents! !